Waffles Liègeoise. NOT to be confused with Belgian waffles or the numerous other variations that exist. The Liège variety is slightly sweeter (thanks to the chunky pearl sugar unique to its recipe), has a chewier texture and is a little denser than your stereotypical waffle. Waffles are making a bit of a comeback on the food scene, and possibly not for the first time, considering how long they’ve been around. The waffle has existed in some form since the early Middle Ages in Europe, starting as a simple wafer made in decorative iron clamps and eventually becoming the sweet breakfast icon that it is today. The original recipes have been evolved along the way as people added levening agents like yeast, sugar and a key ingredient in Liège waffles, butter (this is literally not a dish for the faint hearted!). You can find the pearl sugar from Essential ingredients shop or online at: http://www.essentialingredient.com.au. But that’s enough waffling on from me (I know, I should be ashamed of myself, ha)…Bon Appétit! 75g fresh yeast or 25g dry yeast. Dilute the yeast with a little bit of the water. If you are using dry yeast you’ll need to leave it to activate for about 10 minutes or until it starts to bubble on top. Put half the flour, the milk and the yeast in a mixing bowl and stir the mix until well combined. Leave to proof, covered with a teatowel for 20 minutes in a warm place. This is known as a starter. Meanwhile, combine the rest of the ingredients together except the hail sugar. Add the ingredients to the starter and knead well for about 5 minutes. Then add the hail sugar and knead until the sugar is well incorporated. Portion the dough in 150g balls. You can cook them straight away or leave them in the fridge for a few hours. If you leave them in the fridge you’ll need to take them out about 20 minutes to warm up before cooking. Cooking time will depend on the waffle iron you have at home, but as a guide it should normally take about 8 minutes per waffle. 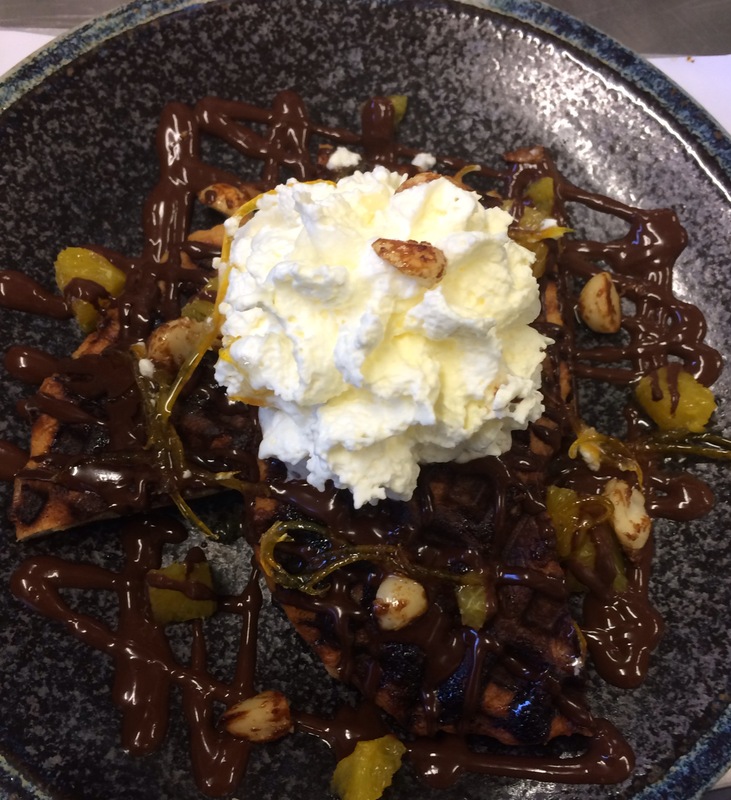 Plate the waffle on a dessert plate or a sharing tray, drizzle the chocolate sauce over the top, arrange the orange segment around it and the Chantilly cream on top! Bring the cream and orange zest to the boil. Once boiled pour it over the chocolate and leave for a couple of minutes to rest to allow the chocolate to melt. Give a quick whisk and keep aside. Pour the cream and the icing sugar in a mixing bowl and whisk with an electric mixer starting on a low speed and slowly increase the speed until the cream holds its shape. A good way to know is to tip the bowl upside down, if the cream stays in the bowl, it’s ready!